But just because you’re not showing off your toes doesn’t mean you should stop pampering your feet! Invest in a quality pair of slipper with a nice warm lining. This way you can keep your feet nice and cozy all day long when you’re at home. Not a fan of slippers? Grab a pair of thick, soft socks and they’ll do the trick! If your feet are sore and achy from a long day of work, try massaging a generous amount of Herbcain’s Warming Balm all over your feet before you hit the sheets. 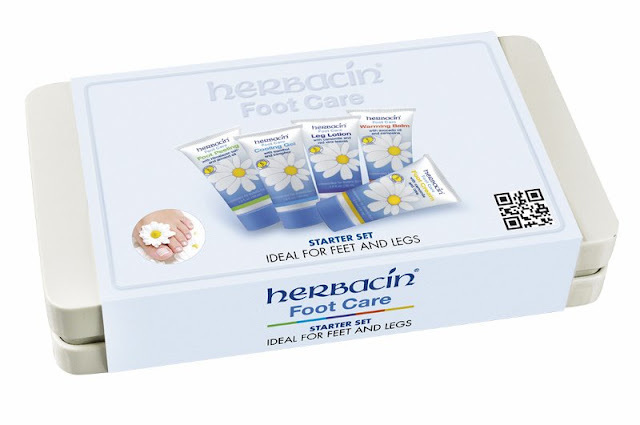 The warming balm will relax your feet muscles and soothe any pain, keeping them relaxed and warm. Slough off any dead skin cells by doing a weekly salt scrub! Either make your own, or purchase Epsom salts from your local drug store. Simply grab a handful of salts while you’re in the shower and massage onto the rough parts of your feet. This will leave your feet skin soft and smooth all winter long! Our Herbacin Footcare pack is a perfect stocking stuffer and if you order from our online store we’ll include our special Footcare tin as our gift with purchase for you to enjoy!